Grew Up... in a medieval, magical land. 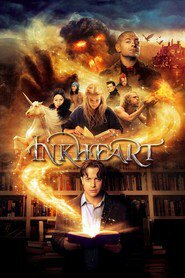 Originally a character from the novel Inkheart, Dustfinger grew up without knowing that he was supposed to be fictional, and he's still skeptical about the notion. Visiting... the supposed 'real' world. After Mortimer Folchart reads Inkheart out loud, his voice brings Dustfinger out of his world and into Mo's. Stuck now for almost a decade in a world where he knows no one and nearly nothing, Dustfinger longs to return home. Profession... fire-eater. Luckily for Dustfinger, it's a profession that's survived technological innovation, and his performances are just as dazzling in Mo's world as they are in the Inkworld. Interests... returning home. But while his homesickness consumes most of his energy, Dustfinger also enjoys the life of a wandering minstrel, honing his fire-eating skills and taming wild animals. One of these animals, a marten named Gwin, is now Dustfinger's only reminder of the Inkworld, and the two are loyal companions. Relationship Status... married, but estranged. Though not for the usual reasons: even after nine years, Dustfinger loves Roxane, but it's hard to reconcile with his wife while being trapped in another world. Challenge... finding his way back to Inkworld. To that end, he's been following Mo around for nine years, trying to get him to “read” Dustfinger back. But since losing his wife to the Inkworld, Mortimer's been afraid of the damage his voice can do, and Dustfinger's been growing increasingly desperate over the years. It doesn't have to be Mortimer – anyone with the power to read him into a book will do. Dustfinger's popularity ranking on CharacTour is #1749 out of 5,000+ characters. See our top-ranked characters and read their profiles.